In 1960, Dylan dropped out of college and moved to New York, where his idol, the legendary folk singer Woody Guthrie, was hospitalized with a rare hereditary disease of the nervous system. Dylan visited with Guthrie regularly in his hospital room. He also became a regular in the folk clubs and coffeehouses of Greenwich Village. He met many other musicians, and he began writing songs at an astonishing pace, including "Song to Woody," honoring Woody Guthrie. In the fall of 1961, after one of his performances received a rave review in The New York Times, Dylan signed a recording contract with Columbia Records. Released early in 1962, "Bob Dylan" contained only two original songs, but showcased Dylan's gravelly-voiced singing style in a number of traditional folk and blues songs. The 1963 release of "The Freewheelin' Bob Dylan" marked Dylan's emergence as one of the most original and poetic voices in the history of American popular music. The album included two of the most memorable 1960s folk songs, "Blowin' in the Wind" (which later became a huge hit for the folk trio Peter, Paul, and Mary) and "A Hard Rain's A-Gonna Fall." His next album, "The Times They Are A-Changin'", firmly established Dylan as the definitive songwriter of the 60s protest movement. This reputation only increased after he became involved with one of the movement's established icons, Joan Baez, in 1963. While his romantic relationship with Baez lasted only two years, it benefited both performers immensely in terms of their music careers. Dylan wrote some of Baez's best-known material, and Baez introduced him to thousands of fans through her concerts. By 1964, Dylan was playing 200 concerts per year, but had become tired of his role as "the" folk singer-songwriter of the protest movement. "Another Side of Bob Dylan," recorded in 1964, was a much more personal, introspective collection of songs, far less politically charged than Dylan's previous efforts. In 1965, Dylan scandalized many of his folk music fans by recording the half-acoustic, half-electric album "Bringing It All Back Home," backed by a nine-piece band. On July 25, 1965, he was famously booed at the Newport Folk Festival when he performed electrically for the first time. The albums that followed, "Highway 61 Revisited" (1965)—which included the seminal rock song "Like a Rolling Stone"—and the two-record set "Blonde on Blonde" (1966) represented Dylan at his most innovative. With his unmistakable voice and unforgettable lyrics, Dylan brought the worlds of music and literature together as no one else had. Over the course of the next three decades, Dylan continued to reinvent himself. Following a near-fatal motorcycle accident in July 1966, Dylan spent almost a year recovering in seclusion. His next two albums, "John Wesley Harding" (1968) – including "All Along the Watchtower," later recorded by guitar great Jimi Hendrix—and the unabashedly countryish "Nashville Skyline" (1969) – were far more mellow than his earlier works. Critics blasted the two-record set "Self-Portrait" (1970). "Tarantula," a long-awaited collection of writings Dylan published in 1971, also met with a poor reception. In 1973, Dylan appeared in Pat Garrett and Billy the Kid, a feature film directed by Sam Peckinpah. He also wrote the film's soundtrack, which became a hit and included the now-classic song "Knockin' on Heaven's Door." In 1974, Dylan began his first full-scale tour since his accident, embarking on a sold-out nationwide tour with his longtime backup band, The Band. An album he recorded with the Band, "Planet Waves," became his first No. 1 album ever. He followed these successes with the celebrated 1975 album "Blood on the Tracks" and "Desire" (1976), each of which hit No. 1 as well. "Desire" included the song "Hurricane," written by Dylan about the boxer Rubin "Hurricane" Carter, then serving life in prison after what many felt was an wrongful conviction of triple homicide in 1967. Dylan was one of many prominent public figures who helped popularize Carter's cause, leading to a retrial in 1976, when he was again convicted. After a painful split with his wife, Sara Lowndes—the song "Sara" on "Desire" was Dylan's plaintive but unsuccessful attempt to win Lowndes back—Dylan again reinvented himself, declaring in 1979 that he was a born-again Christian. The evangelical "Slow Train Coming" was a commercial hit, and won Dylan his first Grammy Award. The tour and albums that followed were less successful, however, and Dylan's religious leanings soon became less overt in his music. Beginning in the 1980s, Dylan began touring full-time, sometimes with fellow legends Tom Petty and the Heartbreakers and the Grateful Dead. Notable albums during this period included Infidels (1983); the five-disc retrospective Biograph (1985); Knocked Out Loaded (1986); and Oh Mercy (1989), which became his best-received album in years. He recorded two albums with the all-star band the Traveling Wilburys, also featuring George Harrison, the late Roy Orbison, Tom Petty, and Jeff Lynne. In 1994, Dylan returned to his folk roots, winning the Grammy Award for Best Traditional Folk Album for "World Gone Wrong." In 1989, when Dylan was inducted into the Rock and Roll Hall of Fame, Bruce Springsteen spoke at the ceremony, declaring that "Bob freed the mind the way Elvis freed the body ... He invented a new way a pop singer could sound, broke through the limitations of what a recording artist could achieve, and changed the face of rock and roll forever." In 1997, Dylan became the first rock star ever to receive Kennedy Center Honors, considered the nation's highest award for artistic excellence. 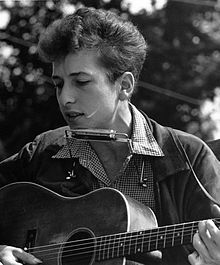 Dylan's 1997 album "Time Out of Mind" re-established this one-time folk icon as one of the preeminent of rock's wise men, winning three Grammy Awards. He continued his vigorous touring schedule, including a memorable performance in 1997 for Pope John Paul II in which he played "Knockin' on Heaven's Door," and a 1999 tour with Paul Simon. In 2000, he recorded the single "Things Have Changed" for the soundtrack of the film Wonder Boys, starring Michael Douglas. The song won Dylan a Golden Globe and an Academy Award for Best Original Song. As of December 2016, Dylan had recorded 35 studio albums. ↑ "Bob Dylan: Tangled up in Jews"
↑ "The Nobel Prize in Literature 2016: Bob Dylan". Nobelprize.org. October 13, 2016. Retrieved October 13, 2016. This page was last changed on 6 May 2018, at 13:44.